Software finds and displays the location of all readings over the threshold temperature. 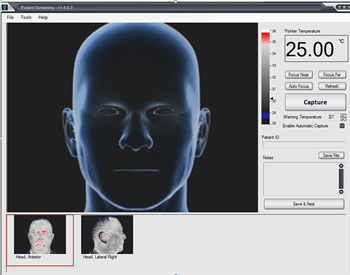 Individual Screening for a close view with the person standing 3-4 feet from the camera for a more definitive evaluation. The most accurate measurement is achieved when the camera lens is positioned at a 90° angle to the subject. The most accurate measurement is achieved when measuring the inner canthus of the eye or the ear canal. 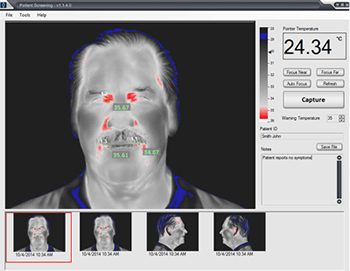 Skin measurement on the face or other exposed areas can be altered with sweat, (up to 3°C) air flow, clothing, oil/creams on the skin, lighting or other artifacts. Skin or surface temperature is not the same as core temperature. A person without a fever (core temperature of 98.6°F / 37°C) will typically demonstrate a thermal reading of 95°F / 35°C in the area of the inner eye. 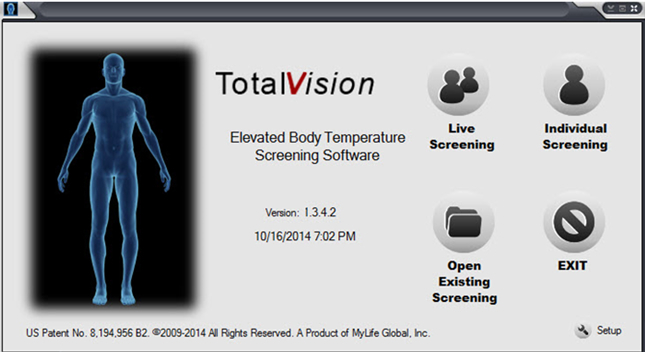 Therefore a thermal reading of 99°F / 37°C would be a truer indication of elevated body temperature. All glass blocks the infrared signal. This image was taken at a distance of 10 feet with a 320 X 240array camera. The person must remove their glasses. 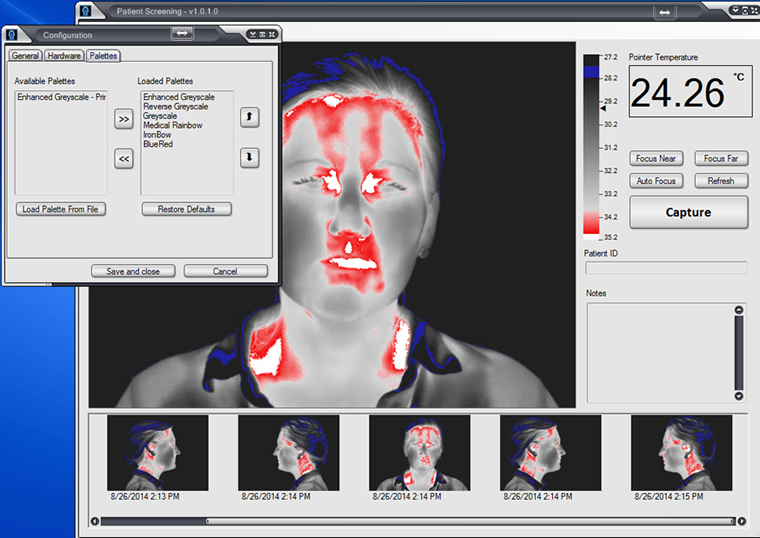 The software is programmed to display 7 spots over the warning temperature which can be diverted to areas with high temperature artifacts, including background lighting. 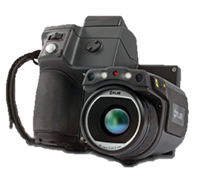 The camera must be set up in an area that does not include outside windows, reflective surfaces or lighting that emits heat in the imaging view. This image is taken at approximately 10 feet from the camera. Although screening a crowd from a distance has been shown in the media, this is not an effective method to accurately measure a small area unless the camera is extreme high resolution. Persons with glasses cannot be measured effectively. We do not recommend distance screening. 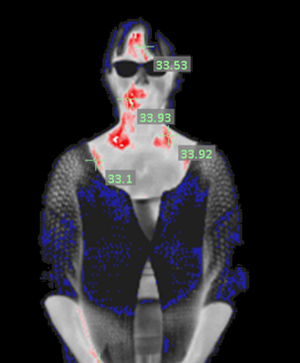 The most responsible and effective method of screening for elevated temperature is to view the person at a distance of 2.5 feet or 76 centimeters from the camera. Remove glasses or other facial obstructions. Make arrangements for secondary screening by medical professional. Make measurement in conditions that will not induce perspiration. a) Instruct the OPERATOR to ensure that the FACE is unobstructed by hair, eyeglasses, and other objects because their presence will interfere with the ability of a SCREENING THERMOGRAPH to detect febrile condition. 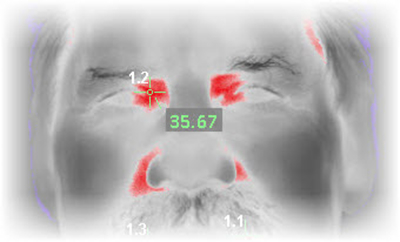 Example: Position of the FACE relative to the lens of the infrared camera. c) Recommend secondary screening with a clinical thermometer of any individual that the SCREENING THERMOGRAPH indicates is possibly febrile. b) A recommendation that the relative humidity in the area of screening should be maintained below 50% and temperature below 24°C to achieve the INTENDED USE and an explanation of the effects of elevated humidty and ambient temperature on the temperature reading caused by sweating. We recommend an individual screening to make a more definitive determination of true fever. Include one or two images: (1) anterior view to measure inner canthus of the eyes or (2) anterior and lateral view to record eyes and the ear canal. 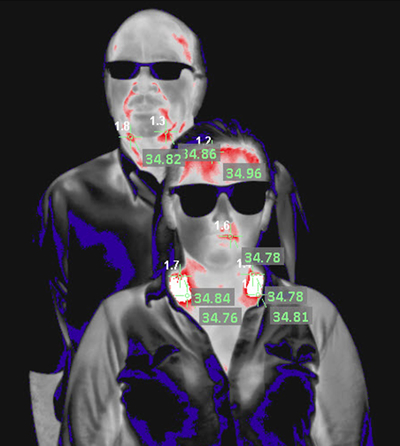 2 views as seen above to measure the eyes and the ear canal for the most accurate temperature. 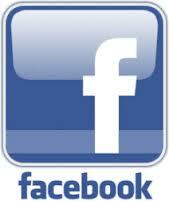 A separate window will open and the screen can be resized to view multiple images on the screen at once. The view will include the temperature measurements.